In the last year or so, headline after headline has surfaced about Melissa McCarthy and her size-inclusive clothing line Melissa McCarthy Seven7. For many of us, the actor-turned-designer had previously never been a go-to name when conjuring up thoughts of Hollywood fashionistas. But as Melissa McCarthy at the 2016 Golden Globes proves, there's a reason she's joined the ranks of beloved celebrity designers. One look through McCarthy's repertoire of award show gowns — like her Emmys gowns from 2011 and beyond — will reveal that the actor is partial to monochromatic color palettes and traditional silhouettes. But it was, perhaps, her custom Marchesa gown from the 2014 Emmys that revealed the 45-year-old comedy queen was also a style genius. And at the Jan. 10 Golden Globes this year, things are no different. Tonight, McCarthy is wearing a much more shimmering gown than we've ever seen on the actor. 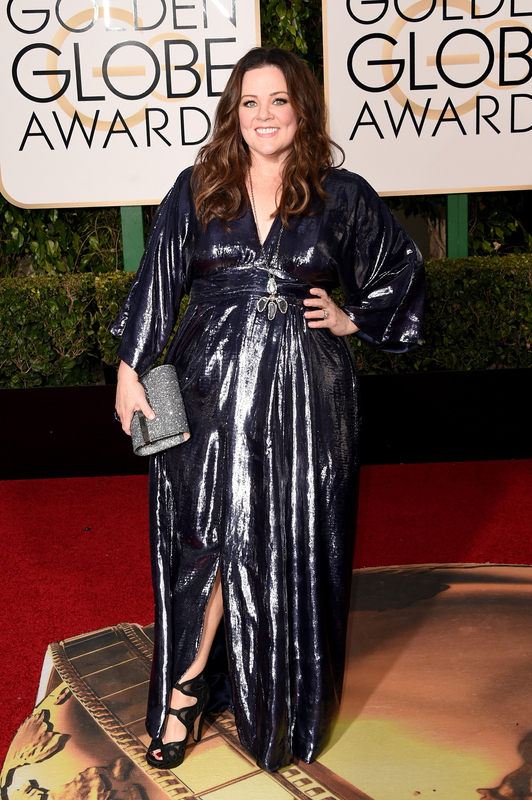 Like her Melissa McCarthy Seven7 line, her aesthetic tonight is subdued yet sparkly. McCarthy's style has always seemed no-fuss: Elegant, but not dull. Classic, but not dated. And this all-over glimmering, wet look gown falls in a similar vein. Styled with impeccably wavy yet minimalistic locks, McCarthy is proving that she has way more to offer the fashion world than simple patterns and black and white ensembles. Nominated tonight for Best Actress in a Motion Picture Musical Or Comedy for her role in Spy, it's safe to say that the time has come to officially equally recognize McCarthy for both her acting prowess and impeccable sartorial skills.